The Indian jewellery tradition is rich with both beauty and meaning. Of the three types that all the jewellery made in the subcontinent could be classified into, temple jewellery is the most beauteous. The other two are spiritual jewellery, which are astrological prescriptions of gems and beads; and bridal jewellery that draws from the aesthetics of temple jewellery and the luxuriance of spiritual jewellery. Temple jewellery is dominated by the king of precious metals, gold, and are designed to adorn the idols in India's magnificent temples. 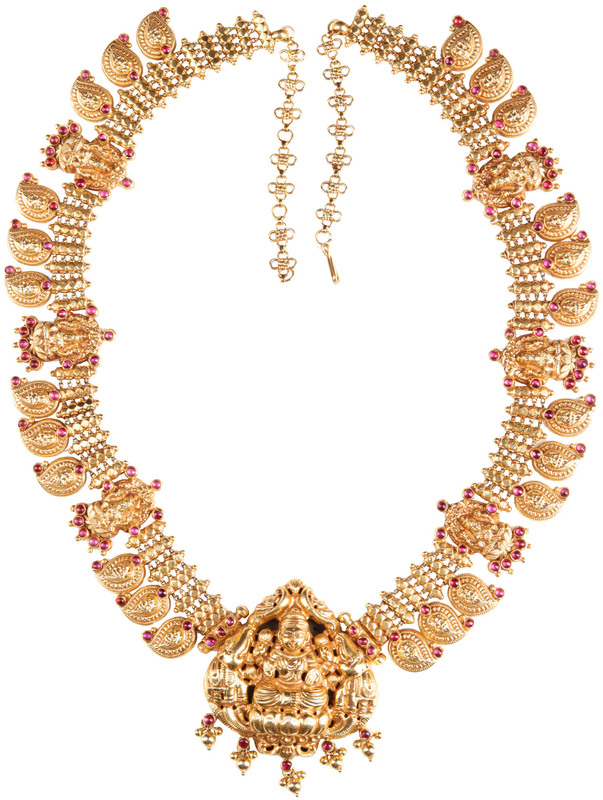 The Lakshmi necklace that you see on this page is a fine example of temple jewellery of the South, where the best of Indian temples reside and consequently the best of gold jewellery is made. Like the quintessential piece of temple jewellery, this necklace has a charm that is otherworldly. It is for the regal - nay, divine - appeal of traditional South Indian temple jewellery that classical dancers have been donning them in their devotional routines. This one is but a series of miniscule clasps with dangling paisley-shaped nuggets of precious metal. Each series is punctuated by a Devi Lakshmi figurine, the largest of which lies at the bottom of the necklace in enshrined padmasana (lotus-seat) glamour. Fashioned from sterling silver, this is a classic South Indian temple jewellery number that would be a statement addition to your jewellery-box. Note the dreamy pink stones that dot the glittering surface of this piece, enhancing its feminine appeal.